Oh my goodness friends, this was so fun!! Have you painted with your babes before? This was my daughter's first full body painting experience and it was awesome! She loved it for awhile and then when she was done, SHE WAS DONE. We're doing 10 days of simple toddler activities and today is Day 2! You can follow along with me on Instagram (I'm @kristinatoddlerapproved) to see the materials you'll need and activities as they are shared! I'm updating our landing page each day as well! This might be my favorite series ever! * Yogurt and food coloring is a great paint for kids that still try and eat everything! None of the activities I am sharing are hard! 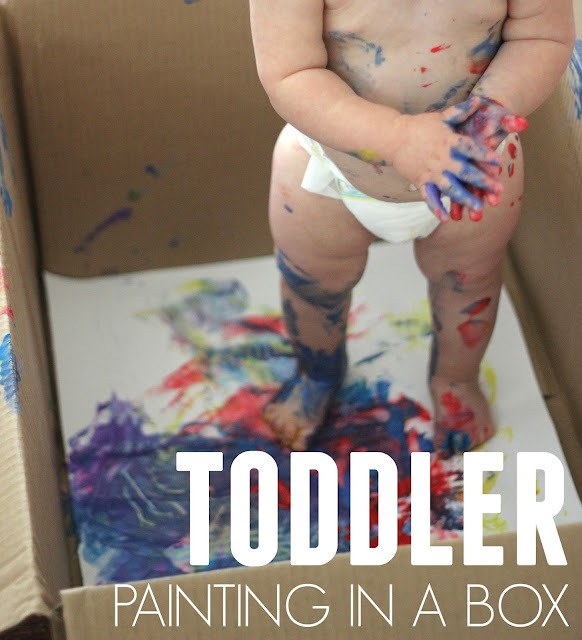 This painting in a box activity is a full body experience and such a neat sensory one too! To contain the mess, I keep a towel right next to the box! The second my kids are done painting, I wrap them up in the towel (so I don't get covered in paint) and then I drop them in the bathtub. Sure, you could just paint in the bathtub... but I'd much rather paint in the box and preserve those little fingers and toys forever on paper. The footprints are adorable! My daughter was especially fascinated by dipping her face and head into the paint! I think the sensation of paint on her face surprised her. It was hard to tell if she liked it or not. After a lot of stomping and squishing (and some tasting), she was done and we had a nice colorful bath! If you haven't tried this before, I dare you to do it! It is so fun! What a good idea, contain the mess some! 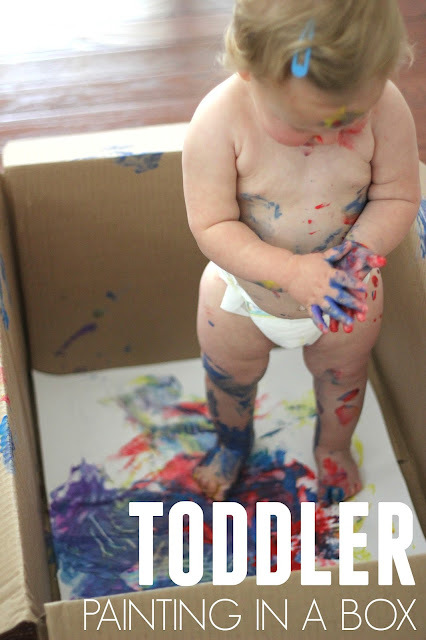 My son would inevitably crawl out and spill paint everywhere but he'd love it while doing it!